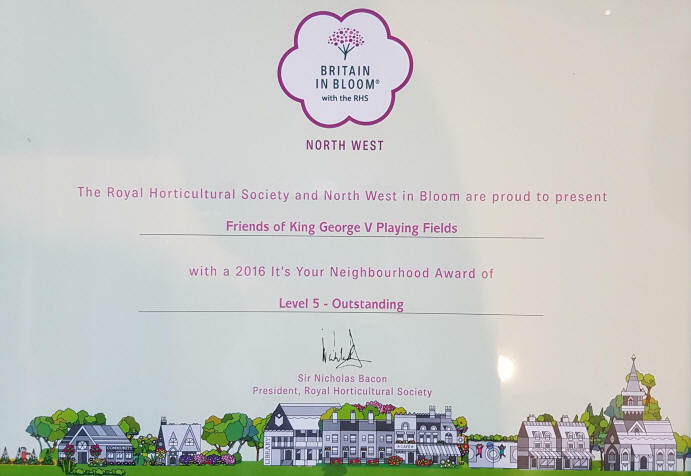 THE Friends of King George V Playing Fields (FoKGVPF) have once again received the 'Britain In Bloom' highest award - level 5 (outstanding) in the North West Britain in the Britain in Bloom, Royal Horticultural Society's, 'It’s your Neighbourhood' competition. This followed an inspection of the work that Friends' volunteers have done in the Ashton park - not merely care of the plants and trees, but everything else carried out by community volunteers such as Georgie Porgies cafe, the bees team, the rubbish pool club and the site maintenance team. If you would like to get involved with the group and help out in the park or work in Georgie Porgies Café, then contact Alan Dean at chairman@fokgvpf.co.uk or Manhar at secretary@fokgvpf.co.uk or goto www.fokgvpf.co.uk for more information. The Friend's of King George V Playing Fields meet on the first Wednesday of each month in Georgie Porgies' Cafe. The next meeting of FoKGVPF is on Wednesday 7th December 2016 at 7.30 at Georgie Porgies.